It has been almost a year since I started selling my designs in the designer’s avenue at Dizengoff Center. Coming out of the studio and the online store has given me a great lesson in sales and a deep understanding of who my customers are. In the direct encounter I can see the items on women of various sizes and proportions. With each one there is an interesting dialogue about what fits her and what she desires. I learn from you each and every time. I love to see how women slowly open themselves to new designs and colors they don’t have in their wardrobe. During the sale I advise and give tips about how to match and about complementary accessories. 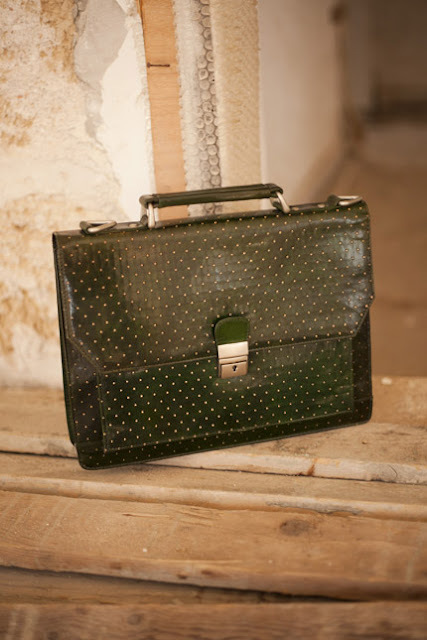 It is important for me to see that the item is flattering and will not sit in the back of the closet, unused. This time I present the ‘Slim X’ pants in a third and last color, earth brown. The pants have a slim and very flattering shape. I enjoy them on a daily basis and I recommend that you try. They are made of soft high-quality Cupro, their shape is clean and accurate and creates a sophisticated chic look. 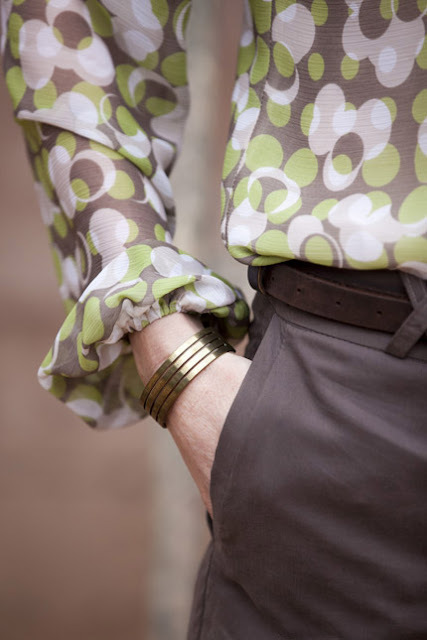 I matched the pants with a Chiffon blouse with a new bubbles pattern in shades of green, brown and cream. The blouse is soft and practical thanks to the front lining that creates opacity and has a nice feel on the body. 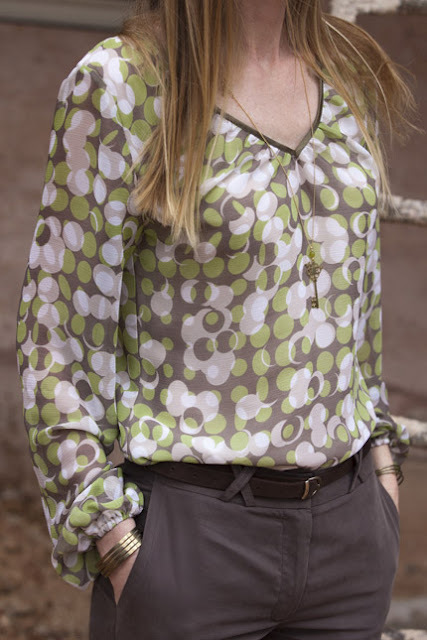 The blouse has a V shape neckline with a diagonal matching olive shaded strip. The blouse is comfortable, flattering and can be worn both in nice autumn days and with a jacket in winter.